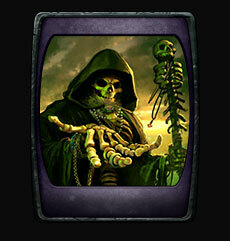 Diseased zombies, undying liches and risen corpses comprise the never-ending undead army of the Forsaken Wastes. The Forsaken Wastes faction has the ability to overrun enemies due to its low-cost champions and its ability to quickly summon units back to the battlefield once destroyed. If you enjoy playing a slow developing but never-ending army of undead champions, The Forsaken Wastes may be the faction for you. Note: Forsaken Wastes tends to be best played by more advanced players. 15/15: Champion runes you own have their cooldowns reduced by 30%. Full Faction: Champion runes you own have their cooldowns reduced by 60%.